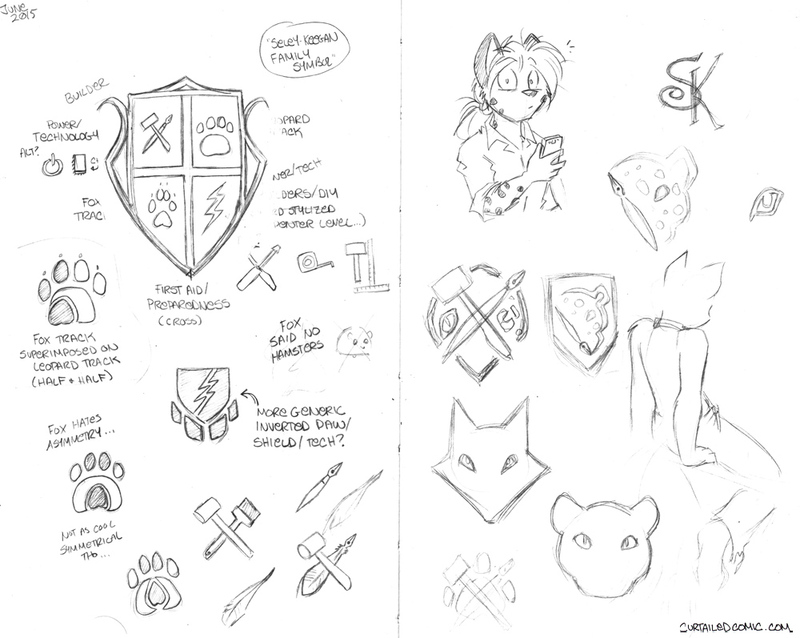 We talked about coming up with a combined ‘coat of arms’ (very, very informally, not at all ‘official’ heraldry) and I doodled some ideas. Tried to come up with symbols reflecting our shared passions/interests. Even if we don’t end up using these ideas for anything, it was a fun thing to think about! Also a random Seley and cat sitting on a banister. This is the first time I’ve ever had to buy a 4′ x 5′ sheet of 3/16th aluminum. I may upload some WIP pictures of armor later. Seley sketch: Another ‘interesting’ text from Mom? I like the expression. @Fox: Aluminum? Steel is real! The shield is steel. At 2′ by 4′ it will already be over 20 lbs. That’s not heavy, until you have to carry it everywhere. For the trim, adding another 3/16ths of steel would make the shield too heavy. Aluminum was chosen for this purpose. Which is probably why most shields were smallish or made of wood 😉 The rest of the time, those guys were incredibly strong. That’s absolutely why they were. The one I’m designing would be considered a pavise. It rivals the size of the Roman scutum, which were made of wood. But they had to haul their shields for miles, move them quickly, hold them upright for long periods of time and use them to save their lives against a myriad of sharp, metal objects approaching them at a high velocity. The only thing I have to deflect with my shield is dude bros and drunk chicks. Tacti-cool, not tacti-cal. could have a fox and leopard as asymetric supporters (the animals on the side that frame the shield) like how Canada has a Unicorn and Lion. Maybe have a little hamster bishop-thing on the top as the crown/coronet piece? I will admit, if nothing else, it make me wanna make one just for funsies. 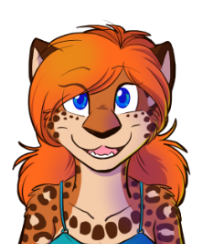 Seley looks all surprised like someone drew that picture of her spontaneously, but she’s the one who drew it! I usually prefer symmetrical, but that asymmetrical superimposed paw looks absolutely fantastic. I also love the inverted shield/paw. Looks like something for a superhero. Asymmetrical designs are not as easy to pull off as purely symmetrical ones, but I think you managed to with that fox/leopard tracks combination. 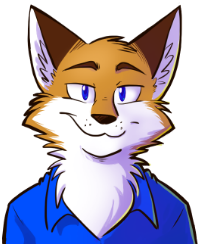 I love the block drawn fox head. It reminds me of the old Fox fishing lure logo. That’s terrible. But it did make me smile a bit. So do you plan on taking Fox’s family name or keeping your own? Or hyphenating, even? For that matter, there’s no reason you couldn’t come up with your own last name. So are you in the SCA? I love all of this. I do agree that the asymmetrical paws look better, though. And I like the suggestion that the leopard and fox hold up the shield. And the hamster bishop! I’m sure Fox will get over it. Besides, it’s just for fun anyway, right? Maybe you can make the fox track smaller and place it on top of the leopard track? Foxes are smaller, after all. And that way it can be symmetrical. It was Mandy’s fault, and as for the story, let’s just say there’s a producer of bad relationship drama shows for the CW that’d love to get our story. Hmm… comments are closed on the last comic. I have just one bit of advice to share on the medieval-themed wedding: remember that giving weapons as gifts to the new couple is terrible luck (an omen that the couple will fight and/or kill each other) and being armed during your wedding ceremony is almost as bad for the same symbolic reasons. I’m all for the “crossed tools” look, though, having once slapped together a quick logo showing a crossed screw-driver and sledge-hammer over an upright soldering iron. It was supposed to be humorous… I was a TV repairman.